The Lexington’s Police Department’s response to an open records request revealed more by what it didn’t say than by the information the department actually provided. After surveillance cameras appeared in Berry Hill Skate Park, I submitted an open records request to the LPD in an effort to determine what other surveillance programs it operates in Lexington. The LPD also uses 824 Body Worn Cameras (body cams). According to its reply, the LPD does not “possess” any other surveillance technologies, including cell site simulators, drones, automatic license plate readers, or any of the other gear I listed in my request. The term “possess” is very important. 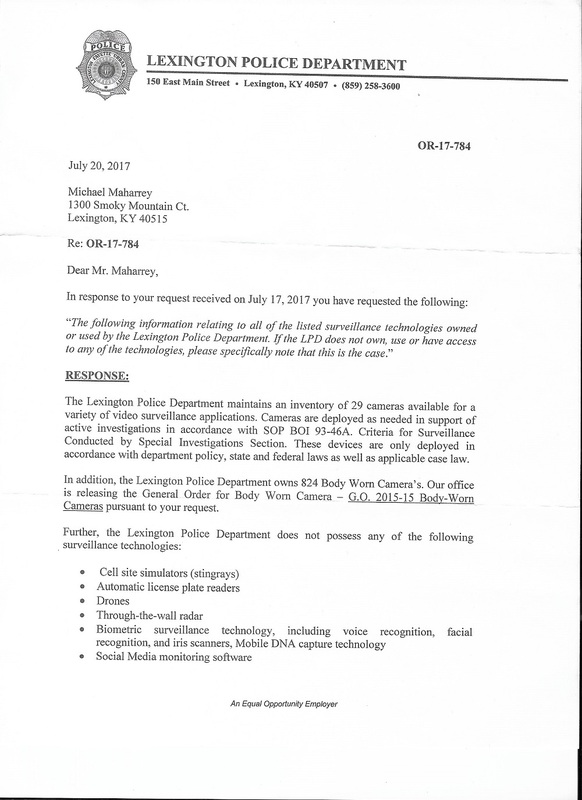 In my request, I asked for information relating to any surveillance technology “owned or used” by the Lexington Police Department. By saying it doesn’t “possess” any of the spy-gear, it leaves open the possibility that the LPD has access to and uses surveillance technologies owned by third parties. This could include private vendors, federal agencies, Kentucky State Police, through partnerships with other local law enforcement agencies. It is even possible the LPD has access to technology owned by other departments in the Lexington Fayette Urban County Government. While the use of the word “possess” could merely be coincidental, experience teaches that government agencies responding to open record requests choose verbiage very intentionally. It seems likely the word was used purposefully to avoid disclosing the full extent of the department’s surveillance technology. Other aspects of the response support this conclusion. But the bottom line is we simply don’t know. This comes as no surprise. The federal government has developed a vast, nationwide surveillance network by encouraging information sharing between state, local and federal agencies. Information collected at the local level often ends up in federal databases. For instance, the Wall Street Journal reported the DEA tracks the location of millions of vehicles. The agency has engaged in this for over eight years, all without a warrant, or even public notice of the policy. State and local law enforcement agencies operate most of these tracking systems, paid for by federal grant money. The DEA then taps into the local database to track the whereabouts of millions of people – for the simple act of driving – without having to operate a huge network itself. 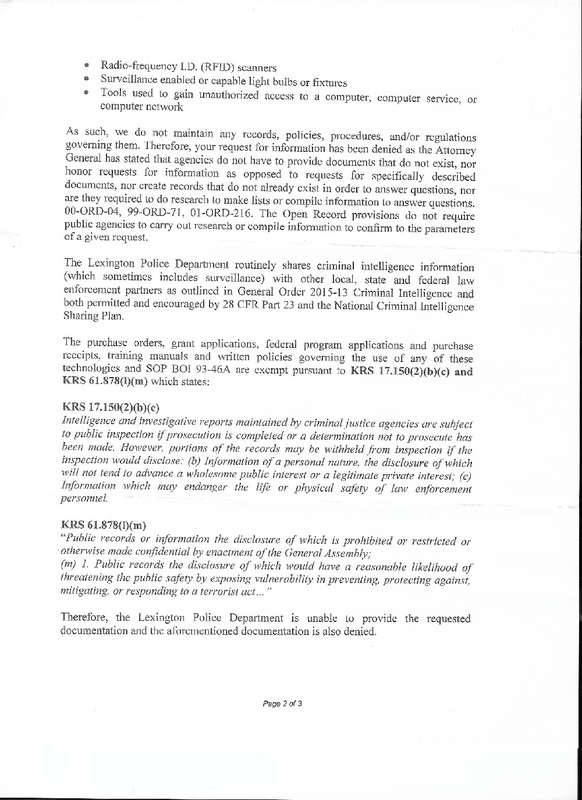 The Lexington Police Department did not provide any additional information about its surveillance programs. It refused to provide any documents, saying they were all exempt from open record requirements. While police could arguably say operational procedures for the use of surveillance technology might fall under this exception, it remains unclear how providing purchase orders, grant applications, federal program applications or purchase receipts do. Again, one could arguably make the case that revealing operational procedures could expose vulnerabilities or reveal important information about police anti-terrorism surveillance. But revealing the mere existence of surveillance technology, or LPD attempts to acquire it – which is all copies of purchase orders, grant applications or receipts would do – certainly would not jeopardize public safety. Using both of these statutes as justification to keep these documents hidden from public examination is patently absurd. 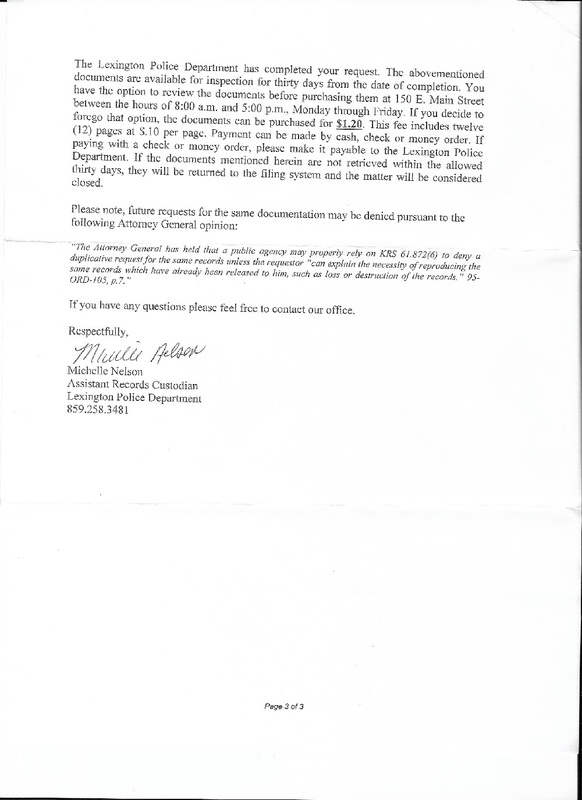 Essentially, the LPD told me the public has no right to know how it spends public funds when related to surveillance. The refusal to release these documents is significant. It implies they exist. Notice the department did not say it doesn’t have purchase orders, grant applications, federal program applications and purchase receipts relating to surveillance technologies. It said I can’t have them and hid them behind statutes. If the documentation didn’t exist, they likely would have just said so. How does one reconcile this with the assertion that the LPD does not “possess” surveillance equipment other than its surveillance cameras and body cams? You really can’t, and that brings us back to the word “possess.” Again, it seems likely the LPD has access to and uses other surveillance technologies. The LPD’s response to my open records request yielded pretty much what I expected. Not a whole lot. This is typical. Law enforcement agencies generally wrap surveillance programs in a veil of secretly, and they generally operate them with little oversight. It’s clear this is the case in Lexington. The bottom line is we don’t really know what surveillance programs government agencies operate, or what policies they have in place to protect privacy and insure the technology isn’t abused. The city council seems to provide little oversight and there exists no transparency – as the response to my records request indicates. The Lexington Fayette Urban County Council needs to pass an ordinance requiring all government agencies to develop a detailed surveillance plan for every technology they acquire and operate. The plan must include provisions outlining how the agency will protect privacy rights, limit data retention and sharing, and ensure minority communities aren’t unfairly targeted. You can download a PDF copy of model ordinance language HERE.